Build a Swing Set You Know your Kids will Love! Have you been dreaming of the perfect swing set for your backyard? Now you can have it! With our Design Your Own feature, there is no dream that’s too big. A single tower swing set is more affordable and is the perfect size for smaller backyards. With that in mind, you have the ability to build this swing set full of action-packed adventure - custom tailored with your child's favorite play accessories. Don't worry, the easy to use design will let you know what option fills in each slot. For extra guidance along the way, be sure to use the location key. You can save as many designs as you would like. Have fun! Once you're satisfied with the design you created, you can simply add it to your cart or order by phone. If you want to resume your design later, you can save it too. Remember, you can build as many swing set designs as you would like. If you have any questions along the way, feel free to give us a call. We have purchased 3 play sets in the past 9 years for our grandchildren. 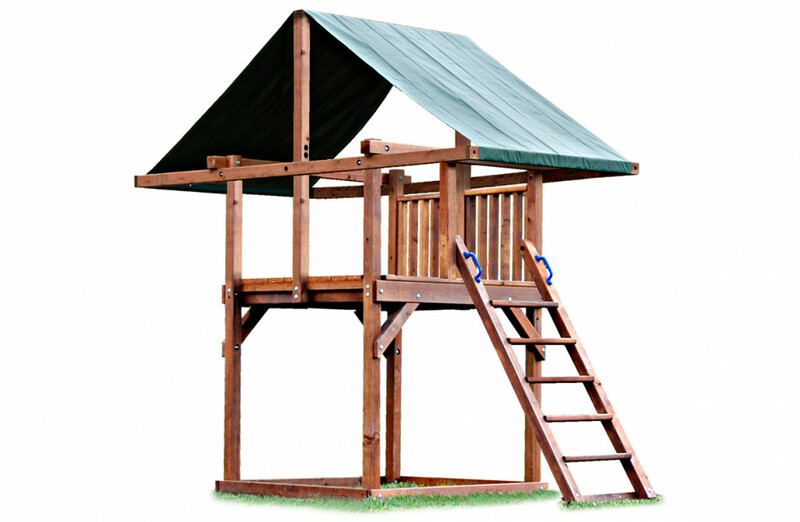 All three families love the play sets - all of them have the tower with a slide and climbing wall and two swings. My favorite is the last one we bought with the picnic table under the tower. The ability to design our own set that met our specific needs was a key selling point. There were many configurations and options to choose from, and the folks at Kids Creations were extremely helpful when reached for assistance. The overall quality is good. I was expecting more substantial lumber, but it turns out that redwood isn't much denser than pine. It's prone to bruising and splintering. I assume that the materials we received are typical of redwood and certainly don't fault the company for that. Overall, the set is holding up very nicely after two years. We're beginning to see some softness at the outer edges of the wood where it remains in constant contact with the woodchips. I would recommend attempting to elevate ever so slightly, perhaps on small pavers. Of course, that may pose a safety hazard. Again, the selection and support was excellent. The materials get it four out of five stars. In many cases, holes do not line up properly and required a bit of extra hammering or drilling to get the bolts to pass through. While none of this compromised the structural integrity, there was a notable lack of percision in many of the pre-drilled holes and joints. Again, nothing that wasn't easily overcome with a good drill and a small sledge. We did have considerable trouble with shipping. The first shipment arrived heavily damaged, and was refused. The second shipment was slightly different from what we ordered. It was easy enough to modify, and again, the folks at kids creations were super helpful. If I had this to do over again, I wouldn't do anything different other than to hire a helper to put it together. A word of warning; do not trying to put this together by yourself. It is possible, but highly in advisable. I could have seriously injured myself on a number of occasions. I heavily researched swing set options prior to buying and I found that Kids Creations was Rainbow quality but at a MUCH better price. So many cheaper options out there are not nearly as safe and sturdy. The custom design option on their website makes it so easy to design your swing set in minutes (add a swing here, move a slide there, etc.). We got exactly what we wanted with this tool. The man who built the set was friendly, capable, and efficient. We've had our play set for almost two years now and we've used it every single day when weather allows--we've spent hundreds of hours on it! The set still looks great through two hard winters. I highly recommend this company and their custom option. Overall great product, had a couple of cracked boards initially, but they were replaced without issue. The initial installation included the the installer breaking out the rear window of his truck in our back yard. He told us he broke the window in the street. While walking in our back yard, we discovered the thousands of tiny pieces of glass in the grass. This began the hours of searching through the grass picking up glass. We also initially did not get the correct colored swings we ordered, this was also corrected. The canopy cover got a hole rubbed into it after the first year from the cross support. We were able to reverse it for the second year, but we expected the canopy to last beyond the first year. Thank you so much for all your assistance and service in helping us acquire a fantastic swingset. It arrived in just a couple weeks, just as you promised. Indeed, you helped us get it here just in time for my husband to build it before his foot surgery. We have had it a month now and are using it all the time! That includes the grown ups. We are so impressed with how attractive and sturdy it looks and feels! The ladder is very large and sturdy. Indeed, the entire playset, wood and accessories, is so much higher quality than we see in most other people's backyards. In fact, the only comparable playsets I've seen around have price tags that are at least a thousand dollars more. At least. We look forward to adding on to our set in a couple years, perhaps another level! Since we put our playset on a slope (so it can get shade and have a nice view of the surroundings from the fort), we had to adjust the slide and ladder as seen in the picture. My husband, a physics teacher, and I designed the adjustments and then we called you to buy some more wood. The shipment of extra wood arrived in just a couple days, just in time for us to finish the playset for my daughter's birthday. Thank you!!!! We love the bottom floored-in level for picnics and shaded play. We leave toys out there. Each and every attachment is used a lot by my oldest daughter, age 4. My just turned 2 year old enjoys not only the baby swing, but also the glider swing and the fort area, both upper level and lower level. I enjoy the disk swing best myself! The slide is very fast! We are so proud we took the time to research playsets and found your website. We have no regrets about our decision to buy from you. We now tell everyone who is looking to buy a playset about your website. Just wanted to drop a few lines to express my appreciation on your product and services. I would say I have never done anything like this before and this is my FIRST time emailing a company to express my thanks. I am one happy customer. Not only that your product exceed my expectations but your customer service is just unbelievable. The instructions were easy to follow. FATHERS, listen to your salesman and read the instructions at least twice before you assemble your set. And yes, they are all there. I thought I was pretty handy (as I have remodeled my home multiple times) and only scanned through the instructions once. I got stuck in the middle of the set up and had to call Kids Creations. They walked me through and waited on the phone while I tried out their suggestions. Man, I was forever thankful. I am Field Applications Engineer and I have recommended your website and product to pretty much all my customers and neighbors. I usually don't brag about anybody's product but my hat is off to your company. Outstanding product, outstanding service and the price is so competitive (I'd have paid more had I known that your product and services were this exceptional... and that is no lie). I am so glad that I stumbled on your website during my google search for my daughter's swing set. Attached is the finish product. Thank you so very much. We have two daughters (4 and 3 years old). The four year old is very active and the three year old tends to be more quiet. This set has plenty for both of them. The four year old can climb and swing until she get exhausted. The 3 year old uses her imagination in the sandbox and on the play deck with an occasional excursion onto the swings or the rock wall. The set packs the maximum fun into the space we have and appears to be very high quality (we had it for one summer). We are very pleased so far. Had a few cracked structural members, took a couple of months to get replaced. Took three tries to finally get the correct swing. Installer broke out his rear window in our back yard. It took us over an hour to find all (or at least we hope all) of the glass. The installer did not level the swing extension cross member and when asked about it multiple times I was ignored. We purchased the add on picnic table that the kids love, however the table portion is not centered in the opening so only the younger kids can fit on the one side. Again when I asked about this I never got any answers.